Text: 1798 Decem 3. Went to the Play – which was the Grecian Daughter. Mrs. Merry acted the Part of Euphrasia. In it she exceeded every Thing, that I have ever seen before in the Theatrical Way – Her voice – Attitudes – Expression & Countenance were admirable – & I cannot conceive an Idea above her performance. Mr. Wynel [sic] acted the Part of Evander – with much Taste & accuracy. Mr. Warren as Dionysius played correctly – but I do not think him a Pleasing Actor. Mr. Hardinge as Phocion was but middling – his Irish Brogue hurt the Performance. He possesses no Dignity of Action or Attitude. The Farce, which was the Shipwreck, afforded amusement – but observations take too much Time to bestow them on a Farce. The Tragedy of the Grecian Daughter is the most Pleasing one I ever saw – it concludes happily, which the most of Tragedies do not. The Affection of Euphrasia to her Father, her Constancy, her Fortitude & Heroism – charm the mind & the happy Issue which ended all her misfortunes renders the Spectator happy. Mr. Taylor objects strongly to my visiting the Plays – he says he cannot find an excuse, either to himself, or to my Father, for bringing me up in such a dissipated Way, as he pleases to name it. I am sorry for it. Certainly it is expensive, but I think it the Best possible School for Morality & Knowledge of the World – my Father always told me so & that if he could afford it, I should attend the Theatre constantly. Mr. T. calls it Dissipation; to most of those who attend Plays it is so, but I am always an attentive observer of what Passes without entering into any of the Dissipated scenes which I see going on. I never walk the Lobby, stand at the Bar drinking – or in the Oyster House – but always get the most Instruction I can out of everything I see and hear – whether Real or acted. It is a School which in some measure supplies the Plan of experience by shewing scenes which tho’ Generally a little Exaggerated, Still shew the Passions, the Faults, the Weaknesses of men – & there are those who will Learn Wisdom only by Experience – who if They will Pay attention, may make the Stage answer a very good Purpose to Them. Comments: William Osborn Payne (1783-1804) was an American who died young, leaving a diary that was later printed privately. His younger brother was the actor, playwright and poet John Howard Payne (author of ‘Home Sweet Home’). The Grecian Daughter was a tragedy by the Irish author Arthur Murphy. 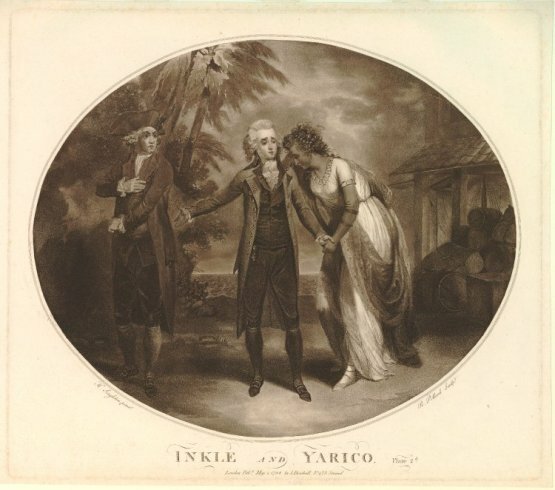 The leading performer in the production seen by Payne at the Holliday Street Theater, Baltimore, was Ann Brunton Merry (1768-1808), a British actress who enjoyed considerable success in America from 1796 onwards. The part of Euphrasia in The Grecian Daughter was one of her signature roles. Other performers mentioned include Thomas Wignell (later Ann Merry’s second husband) and William Warren (later Ann Merry’s third husband). The play was accompanied by the comic opera The Shipwreck. Text: Letter II. Tuesday Night. I am just returned from the Spanish Comedy. The Theatre is painted with a muddy light blue, and a dirty yellow, without gilding, or any kind of ornament. The boxes are engaged by the season: and subscribers only, with their friends, admitted to them, paying a pesetta each. In the pit are the men, seated as in a great arm’d chair; the lower class stand behind these seats: above are the women; for the sexes are separated, and so strictly, that an officer was broke at Madrid, for intruding into the female places. The boxes, of course, hold family parties. The centre box, over the entrance of the pit, is appointed for the magistrates; covered in the front with red fluff, and ornamented with the royal arms. The motto is a curious one, “Silencio y no fumar.” Silence and no smoaking.” The Comedy, of course, was very dull to one who could not understand it. I was told that it contained some wit, and more obscenity; but the only comprehensible joke to me, was “Ah !” said in a loud voice by one man, and “Oh!” replied equally equally loud by another, to the great amusement of the audience. To this succeeded a Comic Opera; the characters were represented by the most ill-looking man and woman I ever saw. My Swedish friend’s island of hares and rabbits could not have a fitter king and queen. The man’s dress was a thread-bare brown coat lined with silk, that had once been white, and dirty corduroy waistcoat and breeches; his beard was black, and his neckcloth and shoes dirty: but his face! Jack-ketch might sell the reversion of his fee for him, and be in no danger of defrauding the purchaser. A soldier was the other character, in old black velveret breeches; with a pair of gaters reaching above the knee, that appeared to have been made out of some blacksmith’s old leathern apron. A farce followed, and the hemp-stretch man again made his appearance; having blacked one of his eyes to look blind. M. observed that he looked better with one eye than with two; and we agreed, that the loss of his head would be an addition to his beauty. The prompter stands in the middle of the stage, about half way above it; before a little tin screen, not unlike a man in a cheese-toaster. He read the whole play with the actors, in a tone of voice equally loud; and, when one of the performers added a little of his own wit, he was so provoked as to abuse him aloud, and shake the book at him. Another prompter made his appearance to the Opera, unshaved, and dirty beyond description: they both used as much action as the actors. The scene that falls between the acts would disgrace a puppet-show at an English fair; on one side is a hill, in size and shape like a sugar-loaf, with a temple on the summit, exactly like a watch-box; on the other Parnassus, with Pegasus striking the top in his flight, and so giving a source to the waters of Helicon: but, such is the proportion of the horse to the mountain, that you would imagine him to bet only taking a flying leap over a large ant-hill; and think he would destroy the whole oeconomy of the state, by kicking it to pieces. Between the hills lay a city; and in the air sits a duck-legged Minerva, surrounded by flabby Cupids. I could see the hair-dressing behind the scenes: a child was suffered to play on the stage, and amuse himself by sitting on the scene, and swinging backward and forward, so as to endanger setting it on fire. Five chandeliers were lighted by only twenty candles. To represent night, they turned up two rough planks, about eight inches broad, before the stage lamps and the musicians, whenever they retired, blew out their tallow candles. But the most singular thing, is their mode of drawing up the curtain. A man climbs up to the roof, catches hold of a rope, and then jumps down; the weight of his body raising the curtain, and that of the curtain breaking his fall. I did not see one actor with a clean pair of shoes. The women wore in their hair a tortoise-shell comb to part it; the back of which is concave, and so large as to resemble the front of a small bonnet. This would not have been inelegant, if their hair had been clean and without powder, or even appeared decent with it. I must now to supper. When a man must diet on what is disagreeable, it is some consolation to reflect that it is wholesome; and this is the case with the wine: but the bread here is half gravel, owing to the soft nature of their grind-stones. Instead of tea, a man ought to drink Adams’s solvent with his breakfast. Comments: Robert Southey (1774-1843) was a British poet, historian and biographer, serving as Poet Laureate for the last thirty years of his life. He travelled to Portugal and Spain in 1795, staying with an uncle who was chaplain to the British community in Lisbon. Southey’s account of his stay was his first published prose work.